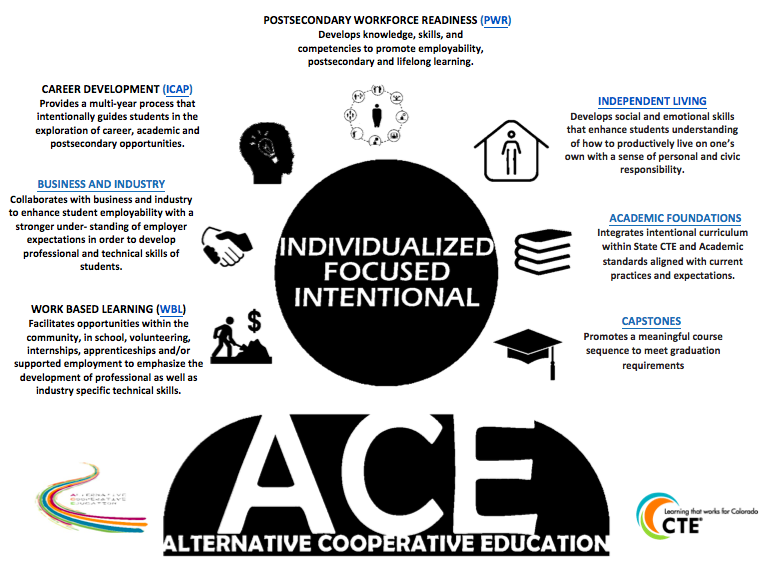 Alternative Cooperative Education (ACE) Career & Technical Education (CTE) is a multi-occupational pathway that facilitates individualized, developmentally appropriate programming necessary to support CTE students successfully. This includes students identified as Special Populations1. ACE CTE Programming is developed through collaboration with educators, business representatives and community stakeholders. The collaboration creates locally responsive, relevant work-based & school-based learning experiences. ACE CTE students will demonstrate competency in Postsecondary Workforce Readiness (PWR)2 that lead to technical skill attainment3 in any chosen occupation with a focus on high wage4 occupations or high skill in high demand industries that promote self-sufficiency..
Special Populations (per Perkins Authorization): Is defined as individuals with a disability, in non-traditional fields, are displaced homemakers, economically disadvantaged individuals including youth in foster care, are English language learners, and single (teen) parents. Academic: discernment, apply skills and knowledge, critical thinking and problem solving, inquiry, analysis and evaluation. Technical Skill Attainment is defined as: the knowledge and skills determined by Career & Technical Standards and competency measures that are mastered by the student in a CTE program. This verification can be completed by delivering educator/employer formal assessment & evaluation; performance based assessment or from artifacts reflecting work experience accumulated in a portfolio, among other verification models; including, but not limited to: developmentally appropriate completion of a CTE course sequence and skills outlined in individual training plans for work based learning. The ACE programs have undergone a redesign of structure and a clarification of role and function in the Colorado CTE system. This redesign was rolled out at the CACTE Conference in July 2017 and schools have the opportunity to adopt the new program as redesign in the 17-18 school year. All ACE Programs will be required to implement the new design by the start of 19-20 school year. If up for renewal, each ACE CTE Program (new and revised) will be placed on a ‘Conditional Status’ until full implementation begins in 19-20 school year. Please note that this Conditional Status is not punitive for anyone. It is simply the state offices’ way of tracking implementation. If your program is not up for renewal, it will stay as is. Once renewed, ‘Conditional’ status will be applied. See ACE CTE ReDesign Products. Coming Soon! A Technical Assistance and Implementation training / messaging model. Contact us for support in implementation.